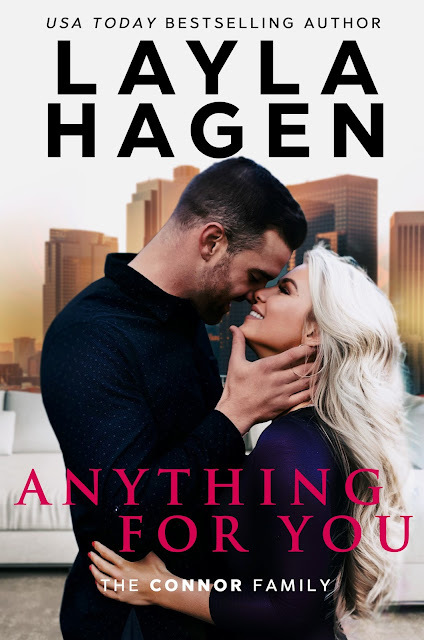 We are so excited to share a first look at Layla Hagen's new series, The Connor Family, and the first book, ANYTHING FOR YOU, which releases May 7th! Check out the full cover below, find out more about the Connors, read teasers, and find out how you can enter to win an awesome giveaway below! But the tempting landscape designer working for his sister spells a whole lot more than fun. Maddie Jennings is everything Landon didn't think he wanted anymore. He can't get enough of her sweetness, or her sensual curves. Layla Hagen has a great giveaway for running on her facebook page - head on over to check it out!